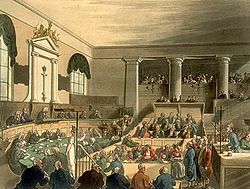 A trial at the Old Bailey in ලන්ඩනය as drawn by Thomas Rowlandson and Augustus Pugin for Ackermann's Microcosm of London (1808-11). උසාවිය (court) යනු නීතියට අනුගතව to adjudicate legal disputes and dispense civil, criminal, or administrative justice සිදුකරීමට නෛතික බලයසහිත රජයේ [[ආයතනය]යි. In common law and civil law states, courts are the central means for dispute resolution, and it is generally understood that all persons have an ability to bring their claims before a court. Similarly, those accused of a crime have the right to present their defense before a court. In the United States, the legal authority of a court to take action is based on three pillars of power over the parties to the litigation: (1) Personal jurisdiction; (2) Subject matter jurisdiction; and (3) Venue. Jurisdiction, meaning "to speak the law," is the power of a court over a person or a claim. In the United States, a court must have both personal jurisdiction and subject matter jurisdiction. Each state establishes a court system for the territory under its control. This system allocates work to courts or authorized individuals by granting both civil and criminal jurisdiction (in the United States, this is termed subject-matter jurisdiction). The grant of power to each category of court or individual may stem from a provision of a written constitution or from an enabling statute. In English law, jurisdiction may be inherent, deriving from the common law origin of the particular court. Courts may be classified as trial courts (sometimes termed "courts of first instance") and appellate courts. Some trial courts may function with a judge and a jury: juries make findings of fact under the direction of the judge who reaches conclusions of law (called a jury trial) and, in combination, this represents the judgment of the court. In other trial courts, decisions of both fact and law are made by judges (called a bench trial). Juries are less common in court systems outside the Anglo-American common law tradition. The two major models for courts are the civil law courts and the common law courts. Civil law courts are based upon the judicial system in France, while the common law courts are based on the judicial system in Britain. In most civil law jurisdictions, courts function under an inquisitorial system. In the common law system, most courts follow the adversarial system. Procedural law governs the rules by which courts operate: civil procedure for private disputes (for example); and criminal procedure for violation of the criminal law. tribunal , යන්න නිදහස් ශබ්දකෝෂය වන වික්ෂනරිය දී සොයා බලන්න. ↑ See generally සැකිල්ල:Usc: "The Supreme Court of the United States shall consist of a Chief Justice of the United States and eight associate justices [ . . . ]" (italics added); සැකිල්ල:Uscsub: "Each court of appeals shall consist of the circuit judges of the circuit in regular active service." (italics added); සැකිල්ල:Uscsub (in part): "Each district court shall consist of the district judge or judges for the district in regular active service." (italics added); සැකිල්ල:Usc (in part): "In each judicial district, the bankruptcy judges in regular active service shall constitute a unit of the district court to be known as the bankruptcy court for that district [ . . . ]" (italics added). මේ පිටුව අන්තිමට සැකසුවේ 19 දෙසැම්බර් 2013 දින දී, 15:10 වේලාවෙහිදීය.